"There was a ship, S.S. Gullfoss, which travelled between Copenhagen, Leith and Reykjavik during the greater part of the 20th century. 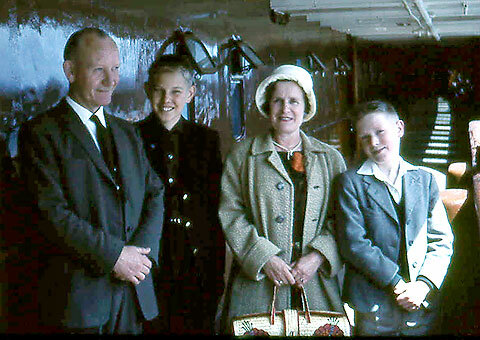 I travelled between Copenhagen and Leith on one of its last sailings in September 1973. This journey took approx. 48 hours." "When we arrived at Leith docks our Volvo Amazon was hoisted overboard in some kind of net. My parents stood on the other side of the wire fencing watching this manoueuvre. As you can imagine our first stop was a car wash after those hours on the North Sea. One of my strongest memories from this journey was approaching the Forth, sailing up towards Leith and feeling the profound historical associations of great people and monarchs of the past making their entry to Scotland."  "M.S. 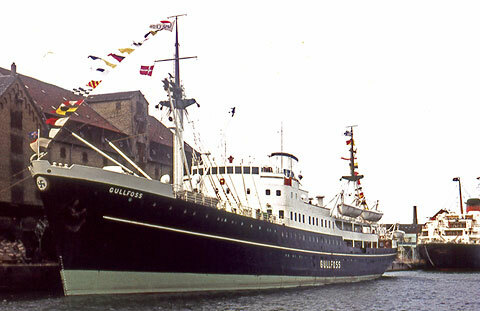 Gullfoss was sold to India in 1973, after the journey we made to Leith in September 1973. ***"
*** Please also see 'Recollections 3' below to read Thorsten Rasmussen's account of Gullfoss following her last sailing to Rejkavik in 1973. After reading Sine MacDonald's comments in 'Recollections 2' above, Thorsten Rasmussen emailed me to tell me that he did believe that MS Gullfoss had been sold to India. Thorsten also sent me this photograph of MS Gullfoss. The photo was taken in Copenhagen Harbour in 1971. Below, Thorsten tells the story of MS Gullfoss after the final sailing on the Copenhagen - Leith - Rejkavik route. "The last summer trip between Rejkavik and Copenhagen was to Reykjavik on 8 October 1973. On 15 November 1973, 'Gullfoss' was sold to Fouad A. Khayat & Co. - Orri Navigation Lines, Jeddah, Saudi Arabia." "The last departure from Reykjavik went to Hamburg where the ship was brought into the shipyard and converted to sail with 1,100 pilgrims in the Middle East. "On 20 January 1974 the ship arrived at Jeddah. On 31 January 1976 she was deployed on the Jeddah - Hodeidah - Port Sudan route."  "On 19 December 1976, while sailing from Jeddah to Port Sudan, a fire broke out on board. All passengers and crew were evacuated and the ship hit a reef. The following day, the ship capsized and was designated a total loss." I also found a little more info about MS Gullfoss on the Internet..
- This Icelandic Wikipedia page refers to MS Gullfoss as having been launched in Copenhagen in 1950. 'This comment about the 30 krónur stamp is totally wrong. The stamp actually shows the M.S. Godafoss III. The text under the stamp is wrong. There has never been a Gullfoss III and Gullfoss never sailed to North America. Thank you to Thorsten Rasmussen for emailing me to tell me about some of his stop-overs in Leith, on his journeys from Copenhagen to Iceland. "When I was a young boy I often sailed with my father to from Copenhagen to Iceland with a stop-over for some hours in Leith. That was just enough time to take walk up Leith Walk to Princes Street, visit the Castle, look at the floral clock in the park and then walk back again to sail on. "When we arrived into Leith we got off the ship from the normal level, but later back on we had to go on board on the top level. After a couple of hours, the water had come back and we could sail to Iceland. It was always a beautiful trip, but sometimes it could be rough, especially in the Pentland Firth just before going out into the North Atlantic. My father was working as the chef in the kitchen." "In Leith Docks, I remember a lorry coming and selling British Cadbury chocolate, Mars bars, Smarties and Quality Street boxes. I also remember Tommy. He worked in the docks and was always in a hurry, carrying his six-pence. He was a funny guy who was teased a lot by his colleagues. Here is a photo of him, taken around 1965." "I sailed into Leith each summer from about 1960 to 1968. One summer, I stayed over for about two weeks, visiting a pen-pal that I had in Leith. His father was Mr Forsyth, a Customs Officer. The family was living at 98 Pirniefield Place. Here is a photo of the family. It was taken around 1965. "During the construction of the present bridge over the Water of Leith in the late-1950's early-1960's, I worked as a shorthand typist for R. Cairns & Co., Commercial Street, being agents for the Iceland Steamship Company. My colleagues were John, Reg and John. From what I remember, we were a great team. The office was on the second floor of the apartments opposite the Customs House. The only heating was a fireplace in each room. If there was a cold spell and a coal shortage, the guys would search around the office looking for anything we could use as firewood. Old chairs usually did the trick and kept us warm until the next coal delivery. I had the impression of something out of a Dickens' novel."  "In the summer months, M.S. GULLFOSS sailed from Reykjavik, Iceland, to Leith once a fortnight, before sailing on to Copenhagen. I believe there was room for about 200 passengers, some of whom disembarked in Leith but most of them stayed on for Copenhagen. On the return voyage from Copenhagen to Leith, there was always loads of cargo for Iceland. When the Bills of Lading, Manifest and Customs formalities were completed, Captain Adelsteinsson invited us to have lunch on board, before sailing. I was usually the one to stay in the office, "just in case .......". The time I did go with the men, boss included, the Drambuie flowed freely. When we disembarked and MS GULLFOSS began her departure, we saw a very angry pilot coming along the quay. 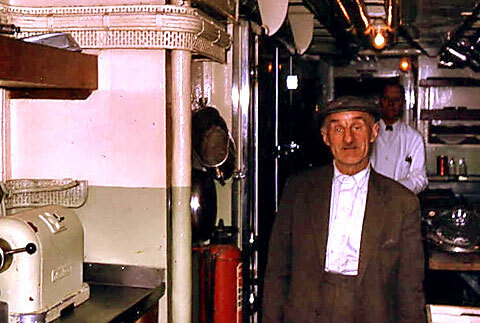 Mr. Cairns had forgotten to inform him of the MS GULLFOSS' departure, so we left them to it!" "In the winter months the M.S. HEKLA, a much smaller cargo vessel, came to Leith once a month (I believe) on a Saturday and left on the Sunday. We all worked like mad to get the Bills of Lading and the Manifest in order as the cargo was being loaded, up to the last minute before departure. Yes, we worked on Sunday and nobody minded." "In July 2013 I made a round trip Iceland with my daughter. In Akureyri I came across the name Adelsteinsson in street names so perhaps the captain of the GULLFOSS came from the north of Iceland. We visited the Herring Industry Museum in Siglufjordur where, to my great delight, I saw an old calendar 1941 of the Eimskipafelag Islands. And, of course, at long last I have seen, among others, one of Iceland's beautiful waterfalls - the Gulfoss in all her glory. What a joy! What a country!" Thank you to Margaret Houliston /Honigh for following up her message in Recollections 5 above with the following message. "I wonder if John, Reg or John will read my Recollections 5. It would be quite something to exchange our recollections. I heard from a friend that Mr Cairns died, a few years ago, in his 90s." "I also read the recollections of others who used to work for The Gibson LIne at the same time as my husband. He worked for the Gibson-Rankin Line. We often sailed from Leith to Amsterdam on the Heriot which was quite a small vessel. If I remember rightly, it usually took 11 passengers. I believe that with 12 passengers a doctor had to be on board - but that's another story!" Hello to John, Reg or John who used to work for R Cairns & Co, and to anybody else who might remember Margaret. If you'd like to send an email to Margaret, please email me, then I'll pass on her email address to you. Thank you to Steven Jenkins, Leith Edinburgh - another contributor who wrote about his memories of MS Gullfoss. "I'm now 56 years old, and remember sailing to and from Leith when I was about 12 or 13 years old, about 1969." "I sailed on the Gullfoss from Leith to Copenhagen and back. I was accompanied by my grandfather, Mr jack Jenkins, who was friends with the captain of said ship due to using it for many years to import wood to his Leith yard, 'Kiezers', later 'Kiezer Venesta' which was by then situated in Lorne Street, off Leith Walk." "The crossing to Copenhagen was made in a force 9 gale and the captain, when he found me hanging over the side in the middle of the night and whilst sailing through the middle of the Danish fishing fleet, threatened to take in the stabilizers, if I thought she was pitching too much. I'll never forget that journey, I slept in steerage in a hammock but ate, when I could, at the captain's table." "The return trip could not have been more different. The North Sea was like a mill pond and a lot of the steerage passengers sat outside on the hold covers, drinking beer, singing late into the night and watching the magic display from the heavens and its stars. Thank you for bringing back that memory." Thank you to Gillian Robertshaw for sending me her memories of sailing on MS Gullfoss. 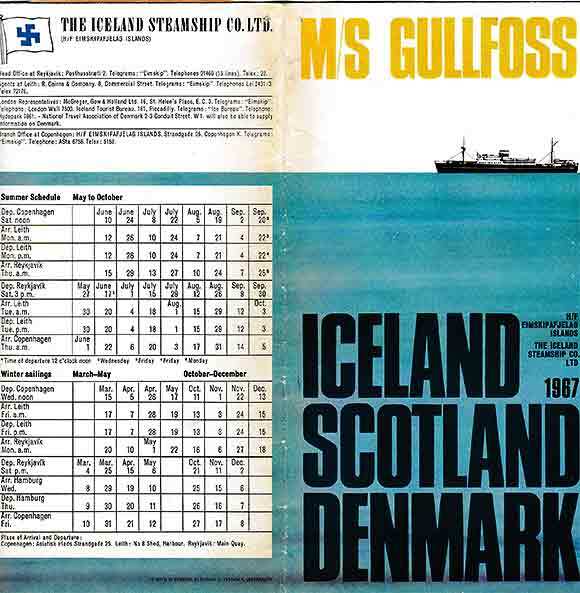 "I have enjoyed very much reading peoples' recollections of MS Gullfoss, and was sorry to read of her unfortunate end." "In July 1967 my friend, Mary, and I hitch hiked from college in Hull to Edinburgh and sailed on Gullfoss from Leith to Reykjavik. The conductor on the bus from Princes Street to Leith docks wouldn’t take any bus fare when he found out what we were doing, a fine example of Scottish kindness to two scruffy students. Many of the passengers aboard Gullfoss were also students, some going to do serious post-graduate work, others like ourselves looking for adventure. I still cringe when I remember how, on the return journey, I convinced a Swedish student that he might see small furry animals in The Highlands called haggis which were hunted and eaten!" "Gullfoss was tossed about as she sailed through the Pentland Firth. In our little cabin in the stern we woke up very seasick, but it was nothing compared to return journey through the firth when there was a force 6 gale. We travelled 3rd class on that leg, which was a dormitory rather like in an old fashioned Youth Hostel. My abiding memory of Gullfoss is of her kind and helpful crew and the air of happiness and excitement among we passengers." 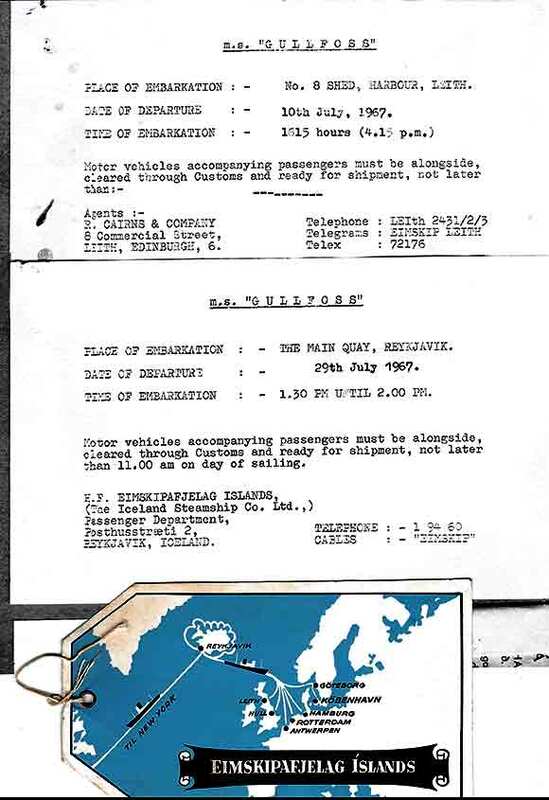 "Here are some documents for the sailings of Gullfoss from Leith in 1967"
"I remember sailing from Leith to and from Copenhagen in the MS Gullfoss in the early-1960s. If you really wanted to experience the pitch and roll and the heave and sway of the ship - or whatever the nautical terms are - then a berth in the bow of the ship was the place to be. Lots of movement. Lots of noise. Very little sleep. On one trip I met a couple of lads. A few years later, while studying in Glasgow, I decide to attend Danish lessons at evening classes at the University of Glasgow. Only two of us turned up the first evening. Yes! The other one was from the Gullfoss. We've been friends ever since. "I also sailed once from Leith to Aalborg on either the ms Belinda or ms Bellona - butter ships, I think they were called for obvious reasons. There were only two cabins with room for 4 passengers in each. We ate with the captain and senior crew. Despite the risk of bad weather I still prefer sailing to flying.